Herbal vinegar makes a lovely gift for your foodie friends, but they are also great pantry staples for you to keep on hand. Once you have a few herbal vinegars in your kitchen, you'll find that you use them often as a quick way to perk up recipes such as potato salad, and garlic chive blossom vinegar as part of a quick but sophisticated salad dressing. You can make herbal vinegar with fresh or dried herbs, and with room temperature or heated vinegar. Hot vinegar is the best method for dried herbs and is ready to use in just a week. However, you'll get a better product with a more balanced flavor if you use fresh herbs and room temperature vinegar. You need a little patience for that method though: it won't be ready for 2 weeks. Lightly crush fresh herbs to release their scent and flavor. Loosely pack the herbs into a clean glass jar (it is not necessary to sterilize the jar first). Pour vinegar over the herbs until they are completely immersed in the liquid. White wine vinegar works especially well for herbal vinegar, but if you prefer to use red wine vinegar, that works as well. I find the flavor of distilled vinegar harsh and never use it. Apple cider vinegar is a good choice for robustly flavored herbs such as sage. Tightly cover the jar and label it with the name of the herb(s) you used and the date. Store at room temperature away from direct light or heat for 2 weeks. Strain the vinegar into an attractive, clean glass bottle. Compost or discard the spent herbs. If you want to float some herbs in the vinegar for decoration, I recommend using a dried sprig or two of the same herb you used to make the vinegar. For example, use fresh tarragon leaves to make the vinegar, but float a couple of sprigs of dried tarragon as decoration in the finished vinegar. The fresh herbs impart the best flavor, but the dried herbs keep their shape and color better. Cork or tightly cover the bottle. I use this method sometimes in winter when the only herbs I have on hand are dried. 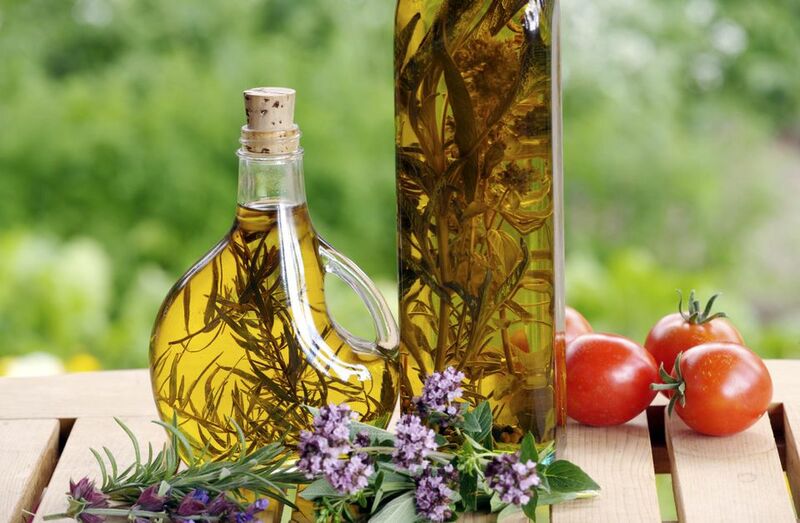 The hot vinegar does a better job than room temperature vinegar of extracting the aromatic oils from the dried herbs. I don't find that the hot vinegar method works well with fresh herbs - they lose some of their flavor in the process. Fill a clean, heat-proof glass jar 1/3 full of dried herbs (it is not necessary to sterilize the jar). Heat vinegar just to a simmer (don't let it get to a full boil). Pour the hot vinegar over the dried herbs. Cover tightly and label the jar with the name of the herb(s) you used and the date. Store at room temperature away from direct light or heat for 1 week. Strain the vinegar into an attractive, clean glass bottle. Compost or discard the spent herbs. Add a few sprigs of dried herbs for decoration if you like (see above). Tightly cover or cork the bottle. Store herbal vinegar away from direct light or heat at room temperature for up to 2 months, or in the refrigerator for up to 6 months.